What we’ve got here is… failure to communicate. Some men you just can’t reach. The iconic “failure to communicate” line in Cool Hand Luke is first uttered by Strother Martin as the stern, insensitive captain in charge of Road Prison 36 where most of the film is set. Lucas “Luke” Jackson (Paul Newman), recently sentenced to the facility after a drunken night of vandalizing parking meters, is proud to be one of the men that the captain can’t reach. 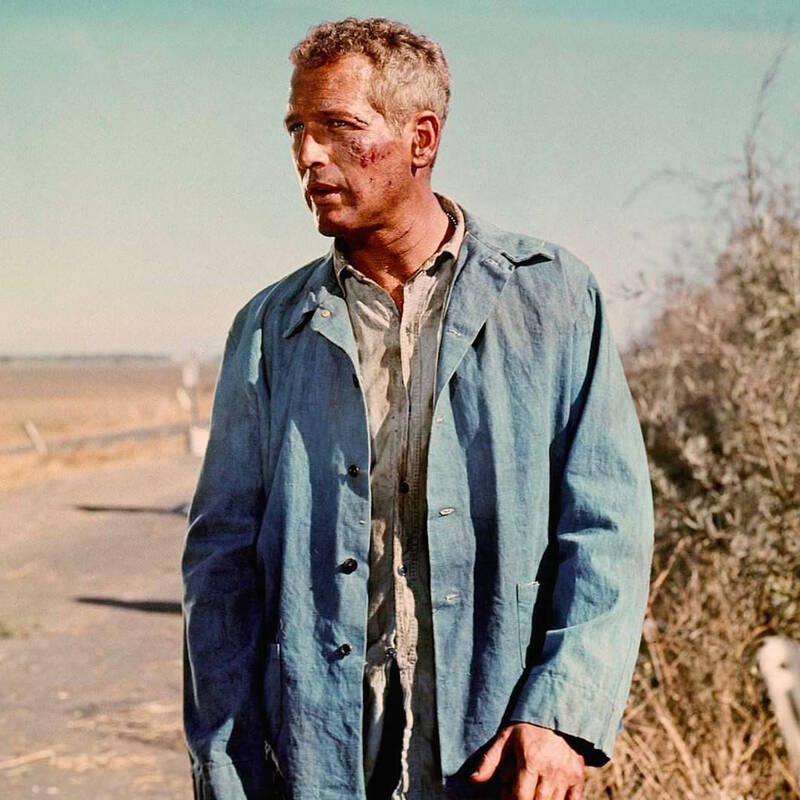 Just in time for the stifling midsummer heat, I’m focusing on Cool Hand Luke, voted one of the sweatiest movies of all time by the patrons of Cheers… in addition to various other accolades. 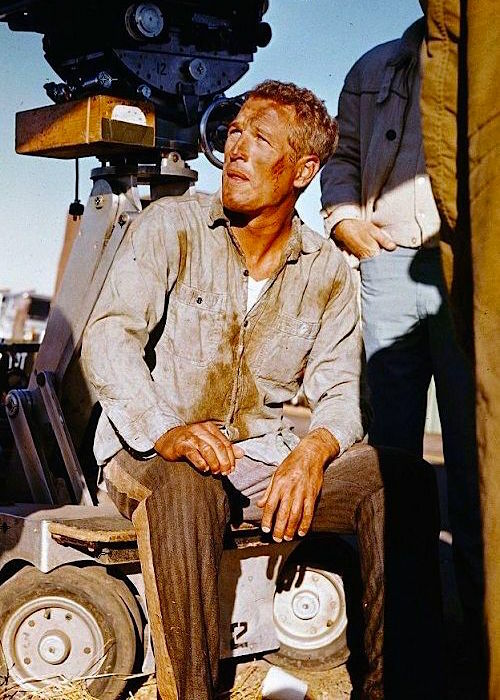 In addition to George Kennedy’s Oscar win for Best Supporting Actor, Cool Hand Luke racked up Paul Newman’s fourth Academy Award nomination for Best Actor as the the defiant and charismatic anti-authoritarian at the heart of the picture. Paul Newman on set during production of Cool Hand Luke (1967). While BAMF Style is certainly not validating prison uniforms or the ostensibly poor life decisions that could lead to one being issued one, Cool Hand Luke‘s protagonist wears his “state issue” with such swagger that Paul Newman elevates the status of his dirty prison duds to a level of iconic cool, emblematic of the era’s rebellious zeitgeist. CARR, the floorwalker, a 240 pound behemoth, is indoctrinating the Newmeat while they change into camp clothing: gray twill trousers, shirt and jacket, all numbered, which has been piled on the table. The evolution of the 20th century represents shifting attitudes toward rehabilitation in the United States. 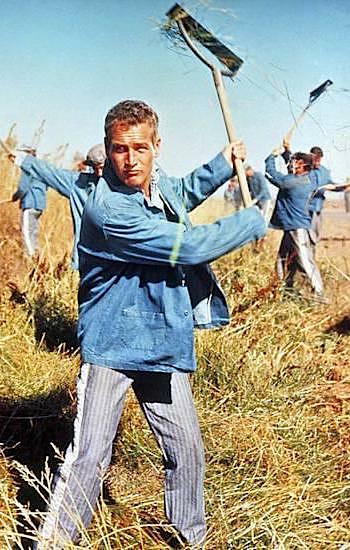 By the 1950s setting of Cool Hand Luke, even Southern prison systems – hardly known for their progressive practices – had been implementing the more “humane” blue or khaki work wear, superseding the stigmatized black-and-white uniforms with their horizontal bee stripes often associated with early American incarceration. Luke and his fellow inmates wear light blue chambray cotton work shirts, similar to those issued by the U.S. Navy during World War II. These shirts button up the front placket with dark blue plastic buttons that match those on the pockets and cuffs. The shirt has two patch pockets, one on each side of the chest, that close with a button through the top. The shirt also has a point collar that Luke leaves open and barrel cuffs that each close with a single button. Luke bids farewell to his mother, Arletta, after her brief but memorable visit. As eight pages of dialogue had to be filmed in one day, the scene would have presented a challenge to many other actors, but stage-trained pros Paul Newman and Jo Van Fleet were perfectly up to the task of performing this near-perfect scene in the short time required. When Luke is returned to Road Prison 36 after his second escape attempt, he is wearing a beige cotton long-sleeved henley undershirt with a three-button placket that he would wear through the end of the film. During his incarceration, Luke continues wearing the same bottle opener necklace around his neck that he wore during his civilian life. This plain steel simple opener is worn on a silver beaded necklace. True Jersey paid homage to Luke’s necklace with this tribute., priced at only $8. While the uniforms of Luke and his convicted cohorts do indeed take some style cues from classic military work wear, it serves reason that their attire would still need some clear indication that these men are prisoners and not just road workers in chambray shirts and jeans. Thus, each inmate at Florida Road Prison 36 is issued a pair of blue-gray striped denim pants with a bold white stripe down each side from the waistband down to the plain-hemmed bottoms. Evidently, the stripes are sewn on over the trouser seams, as Ben – a local boy that helps Luke during his second escape – suggests to him: “Aren’t you gonna take those stripes off your pants?” Luke responds, “You know it, kid,” before easily ripping the stripes off and using them to tie his hacked-apart chains to each ankle. 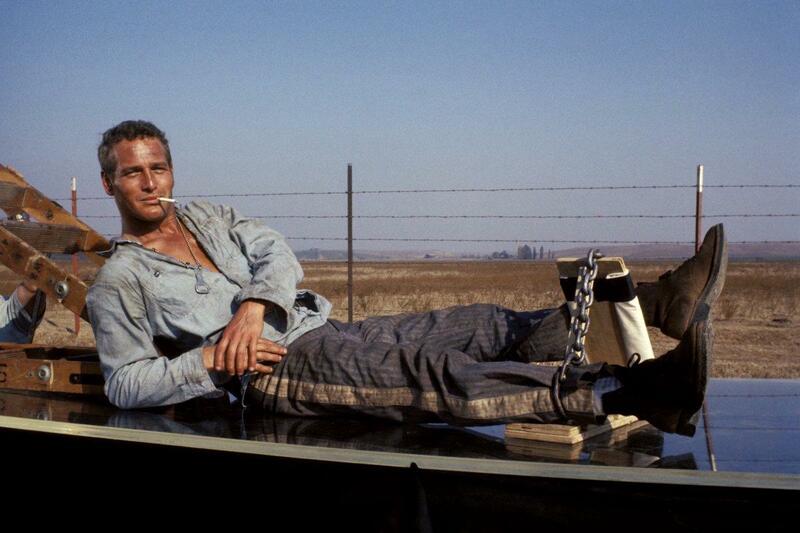 Paul Newman on set, emphasizing the “cool” in Cool Hand Luke. Them clothes got laundry numbers on them. You remember your number and always wear the ones that has your number. Any man forgets his number spends a night in the box. Luke’s prisoner number, “37”, is crudely written on the back of his shirt and the back pocket of his pants. A patch pocket on the back left side, this is the only pocket on the guys’ prison pants, as anyone who needs more than one pocket in prison is surely up to no good… as Andy Dufresne would attest. Luke’s prison number, scrawled on both his shirt and the back pocket of his pants, is said to refer to this passage in the bible. The trousers have belt loops where Luke and the other inmates where a drab brown web belt with a squared gunmetal single-prong buckle, at odds with the modern practice of forbidding belts in prison. In fact, it is likely the prohibition of belts that led to the modern adoption of simpler, more cost-effective prison garb like jumpsuits or scrubs in bold colors like orange (of course), yellow, khaki, or plain white. The inmates also wear brown nubuck leather work boots and light gray crew socks. The plain-toe boots are derby-laced with eight eyelets and hooks at the top. Left: Luke’s boots in the hands of a guard when the laconic prisoners is forced to spend a night in the box. Right: Luke’s boots in action as he’s engaged in the Sisyphean task of shoveling dirt from one hole to another. The inmates are all issued chore jackets in blue denim, a practical and cost-effective outerwear solution that is also consistent with the tone and texture of the rest of their clothing. Luke’s large denim chore coat has a one-piece collar, five dark blue plastic buttons, and hip pockets open at the top. These unstructured, no-frills jackets were popularized by French laborers in the late 19th century and remained commonly seen for workers and prisoners around the world through the 20th century, favored for its relaxed fit and simple construction from breathable, lightweight fabrics like cotton, canvas, and linen. Many examples of classic chore coats remain available from online vintage shops like eBay or Etsy. Luke’s underwear is plain white cotton boxer shorts with an elastic waistband, as opposed to the “tighty-whitey” briefs worn by some of the other inmates. “He is cheerful, drunk, wearing a faded GI Field jacket. A bottle opener hangs on a silver chain around his neck,” described Donn Pearce and Frank R. Pierson when introducing their titular character in the screenplay for Cool Hand Luke. The bottle opener remained, but Luke’s attire for the night of his arrest in the opening scene shifted from the field jacket to a simple khaki cotton short-sleeved shirt with two flapped chest pockets and a large point collar. Unlike the direct connotations of the field jacket mentioned in the screenplay, the khaki shirt winks at Luke’s military association while also being a very practical choice for a ne’er-do-well idling away a hot, drunken summer night in the south. Luke completes his “civilian” outfit with a pair of dark indigo selvedge denim jeans, light gray socks, and dark brown leather boat shoes. Luke wears a timeless casual outfit for a night spent cutting down parking meters. Though set in Florida, the scene was filmed in Lodi, California, where the meter-less poles remained upright for years after filming in this location wrapped. We next see Luke as he arrives at Florida Road Prison 36, following his conviction and sentencing for the brutal crime of “maliciously destroying municipal property while under the influence.” He and the other new arrivals are already wearing their state-issued denim pants with the wide white side stripes, but his boldly printed sport shirt is undeniably his own. Luke prepares to serve two years for beheading parking meters. This short-sleeved shirt – which has a casual camp collar, plain front, and no pockets – is brown with bronze geometric accents throughout and an overlaying pattern of white ornately patterned diamond squares that connect at each corner for a grid-like effect that covers the shirt. The only booze that Luke imbibes on screen is the generic bottle of “Beer” that he guzzles during his delinquent adventures at the film’s opening. (For those interested, the label reads “Fine Quality Beer” and can be found as entry BB-48 in this catalog of offerings from the august Earl Hays Press, a movie prop house that has served Hollywood and its celluloid creations since 1915. If you’re looking for something a little more sophisticated, I direct you to the aptly named Cool Hand Cuke, a refreshing libation offered behind the bar at The Manor Theatre in Pittsburgh’s Squirrel Hill neighborhood. The central ingredients are Beefeater gin, muddled cucumber, and soda, but the magic formula that has made this signature cocktail a seasonal favorite at the 96-year-old cinema’s M Bar shall remain a secret of the expert hands behind the counter. If nothing else, it’s just the libation for washing down fifty eggs. Prison never looked so cool. Looking to see if chambray is right for you? Give this affordable shirt from Amazon’s house brand Goodthreads a spin. If you’re looking for something a little closer to the shirts worn by Cool Hand Luke – as well as U.S. Navy servicemen during World War II – check out this reproduction of a classic USN work shirt from At the Front. Yeah, well… sometimes nothin’ can be a real cool hand.